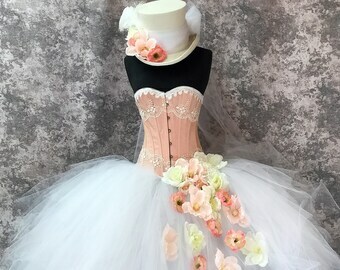 Announcement Thank You for checking out my Custom Corset Couture! 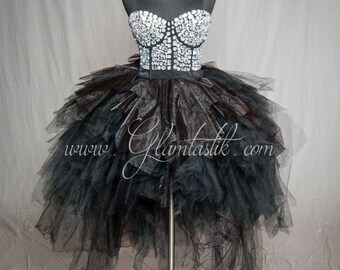 I started Glamtastik to be the leading corset based dress company in the US. I think it is your turn to look and feel Glamourous...Glamtastik is here to help! 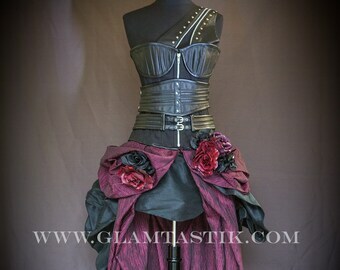 Thank You for checking out my Custom Corset Couture! 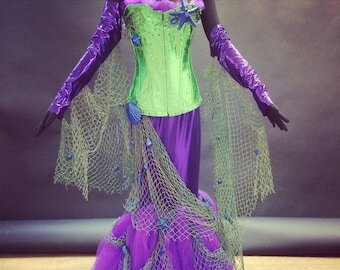 Amazing Dress!! Fantastic quality and fit like a glove! I ordered this for Halloween in New Orleans and it was so much fun to wear. Angela is very thoughtful and took the time to respond to my many questions including back and forth emails on a second dress that I ended up not ordering. The dress arrived super fast and just as ordered. 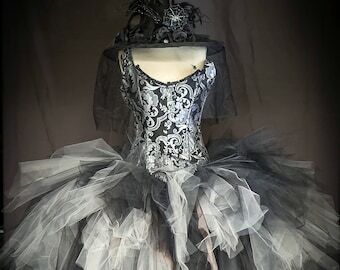 Angela was even so very kind to email me late one night when I emailed her in major distress thinking I had not measured correctly and could not get the dress on (my first corset). She explained very patiently and with some help from my sister it fit perfectly. The corset itself felt amazing and was so comfortable to wear. The layers of fabric and feathers were elegant and hung beautifully. 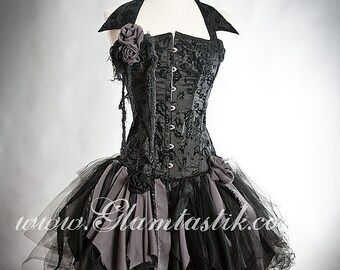 I would have happily paid far more for this dress. I already have my next dress picked out. Thanks again!! I received it way sooner than expected. It was even better quality than I expected. Im excited to order my next dress! Angela Pilat was born in 1982 to Stanley and Bonnie Pilat and from a very young age began to demonstrate her tenacity in the arts. Guided by her parents whom both possess a great appreciation of the arts in combination with business success, Angela matured with a diverse upbringing. Both of her parents were artists as well as entrepreneurs. She gained experience in all of her parents businesses including flower shops, craft stores, hair salons and photo labs. Her exposure first lead to her becoming a professional photographer, capturing beauty and further refining her vision of the arts. She became a mother to a beautiful daughter in 2005 and transitioned from behind the camera to the front by becoming a model in 2006. Her unique experience as both a photographer and model became apparent in furthering her artistic flair. While planning a shoot as a model in 2009, frustrated by the lack of interesting dresses that would reflect her style, she recruited the help of her mother to design dresses that would bring her vision to life. Alas, Glamtastik was born. Angela’s couture dress company, Glamtastik became an instant sensation with thousands of sales as well as corporate sponsorships. The dresses and accessories are an extension of Angela’s vision, capturing her philosophy of “I make what I would wear” and have been worn by people of all ages and backgrounds as well as celebrities and musicians. 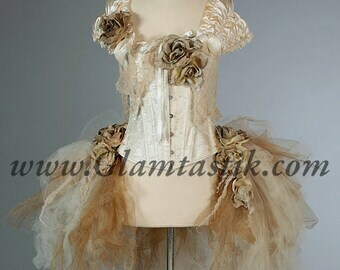 Glamtastik takes great pride in every single creation that we make. Our custom orders take roughly 30-45 days to manufacture. Manufacturing times vary seasonally. We also offer rush services that are available if you need a custom order sooner. Rush service costs vary depending on when you need the design. 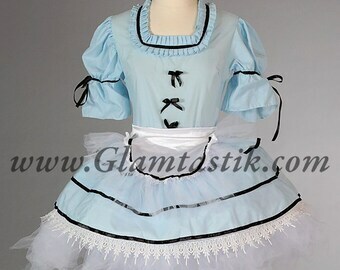 If you need a dress now, we do have plenty of designs that are made and ready to ship. We always have a larger stock of inventory than shown here. So please reach out to us for what you are looking for. We just might have it! We can customize just about all of our designs, so we can create the perfect design just for you! 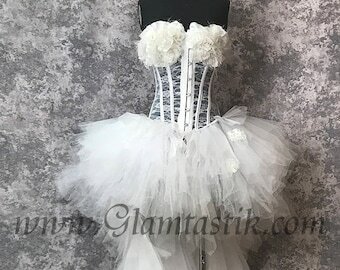 For every custom made design, we will need to know the following measurements..your bra and waist size, as well as the desired length of the skirting. Wearing your heels, you would measure this from your hip bone for the front and back. ALL of our designs are NON REFUNDABLE. Store Credit is available for "READY TO SHIP" designs ONLY. If you would like store credit for a ready to ship item, the dress must be returned to us within 3 working days of you receiving it. The package must be sent back priority mail, post marked with delivery confirmation. Once the item is received in its original condition, you will be given *store credit* minus the shipping fees. Custom orders are NOT AVAILABLE for store credit and are NON REFUNDABLE. Once construction and manufacturing begins, Custom orders are NON REFUNDABLE. In rare cases, if the item is defective in construction (NOT DESIGN), contact us right away. We will instruct you to ship the item back to us for investigation. If we find that the defect is deemed to be on our part, we will then repair the item and ship it back to you right away. We stand by our work and will correct any mistakes made on our end. All payments must be made IN FULL within 2 days of purchase. We accept all major credit and debit cards through Paypal. All payments must be made IN FULL before we will ship, place any orders or get started on your design. All of our shipments go out through USPS Priority mail with tracking.Each package includes $50 insurance. Please ask if you would like your order to have additional insurance. Insurance costs vary depending on value. If you would like to have the item insured at a higher value, please let us know and we will adjust the pricing accordingly without markup. Once we have tracking and your package has been dropped off to USPS we are no longer responsible for your package. We cannot control anything past this point. If it is lost or damaged, you will only be refunded the amount that we receive from USPS for the insured amount. If you would like a different shipping carrier, we can arrange this as well for an additional fee. This is generally considerably more in cost depending on the design and where it is being shipped. Please contact us if this is something you wish to purchase additionally. We ship worldwide. If you do not see your country as an option, please contact us for instructions. All READY TO SHIP items will ship within 3 business days from our facility. All CUSTOM ORDER items take a minimum of 30-45 days to construct and manufacture. If you are in a hurry, please ask about our current wait times. We do offer rush services for an additional fee. Rush service fees vary seasonally and on timing, so please contact us for additional information. Any dress that is an XL or bigger will be charged an additional $100 for supplies and time. Anything over a 34" waist is considered plus size. Our designs do run smaller than normal store sizing.